Last month I took a bus down to Washington D.C. to visit my friend Michael, and meet his lovely wife and baby. It was a great weekend – adorable baby, trip to the zoo… and they were so kind that they even picked out a restaurant with veggie burgers to take me to for dinner! 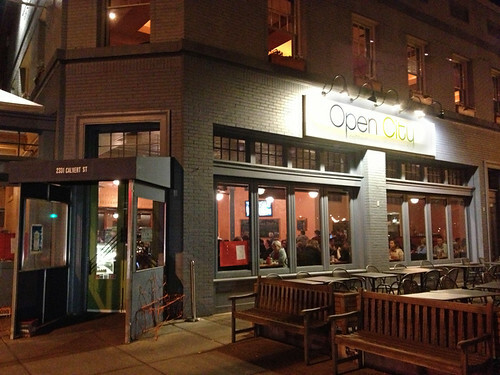 Open City was pretty busy at dinnertime on a Saturday night, and we had to wait a few minutes for a table to be available. Once we were seated, I was pleased to see that the menu had all the vegetarian, vegan, and even gluten-free items clearly labeled. 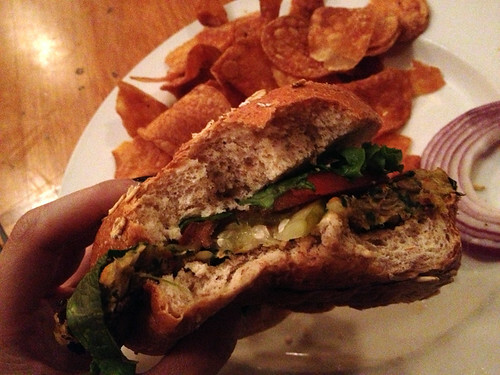 Of course, I already knew I was ordering the vegan veggie burger. 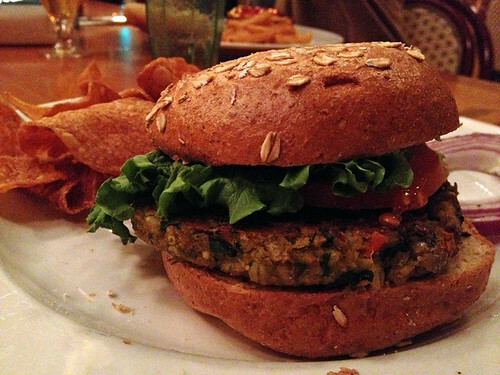 The homemade patty consisted of lentils, barley, oats, and a mix of vegetables. 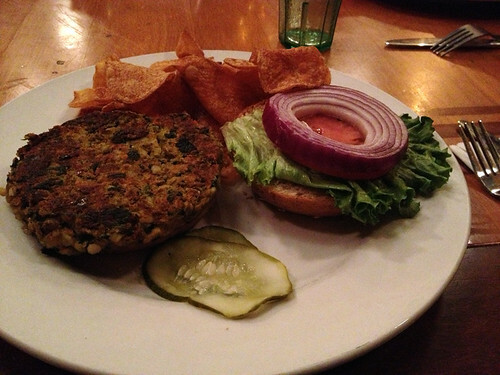 It was nice and hearty – I liked the blend of lentils and grains. Sometimes a burger patty that is too heavy on one ingredient is a little boring. The best burgers are usually a winning combination of many different textures and flavors. The toppings were fresh and crisp – pickle slices, lettuce, tomato, and red onion (far too much red onion for my taste, I only put a few slices on the burger – does anyone actually like eating huge chunks of raw red onion?). I wished there was some kind of sauce included in the toppings though – that extra bit of moisture would have helped (the whole grain bun was rather dense, although tasty), and a bit more spice or sweetness would have been a nice addition to the flavors. I substituted chips for the fries that came with my burger, because Michael’s wife Steph told me that the chips were made in house – and they were quite tasty indeed! So I’d recommend getting those as well. He is quite talented. And if you live in DC and want to hire a professional photographer, I would definitely recommend him!